It’s not often that a book comes out sooner than promised – usually it is quite the opposite, as publishers and editors trot out a huge list of excuses for unforseen delays. 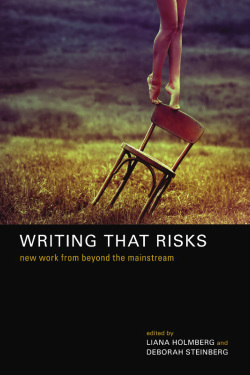 A while back I sold a story to an anthology called Writing That Risks (Red Bridge Press) and was promised it would be ready August/September. So I thought I could safely expect it for Christmas. But today I got an email from the editor informing me that the book is on sale already and available from Amazon, Barnes & Noble and other on-line retailers. I’ve been looking forward to this anthology particularly as it features a story of which I am particularly proud – one that I thought would be hard to find a home for, one that I really enjoyed but one that a lot of readers simply might not get. So thanks to Liana Holmberg for getting it and for buying it and for sending it out into the big bad world. I hope others get it and enjoy it and I’d love to hear from anyone who reads the anthology – one way or the other. This entry was posted in Short Fiction, Writing News and tagged Deborah Steinberg, Liana Holmberg, Red Bridge Press, Writing That Risks. Bookmark the permalink.